Deck Registration Form & Box Winners! The results of last week’s contest are in – see the winners below! Thanks to all that entered last Friday’s giveaway contest on our Facebook page! Congratulations to the winners, and keep following the Facebook page for news about our next giveaway! The Deck Registration Form for MetaX has been uploaded to the Tournament Documents page. This form is applicable to both constructed and sealed events, though it is usually not required at local level events. The Tournament Documents section also includes a (suspiciously strong) sample deck, and this serves as one example of an acceptable way to fill out your list. 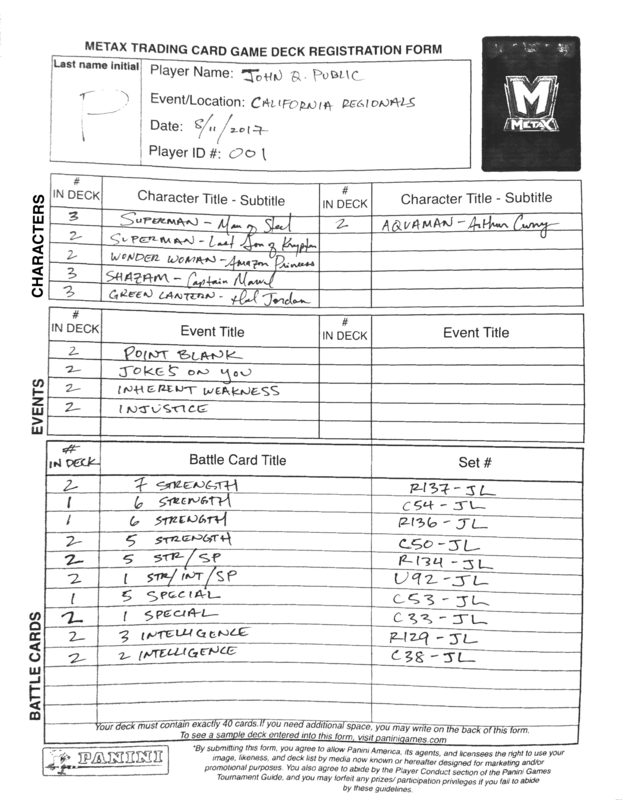 Note that the Deck Registration Form is a fillable PDF, so you can also type your list before printing. You can see a box breakdown in this video from Beckett Media. Boardgame Today checked out the game at San Diego Comic-Con, and their impressions are available here. A new article on The Oblivion Bar makes some early choices for top cards in the game. Playtested games took MetaX for a spin on a live stream. TheUofWildcat has a product review of MetaX available here. That’s all for now, but be sure to check back on Tuesday for more information about Gen Con. With Gen Con taking place next week, don’t miss your last chance to register for a MetaX sealed deck event! If you’re unable to attend, we’ll also be giving away sets of Gen Con promos online! Stay tuned for details next week.